So how did I end up at the equivalent of the “Disneyland of Trail Running” with free access to all the rides? I received a cryptic message during my WS100 planning to see if I was available to be in Europe at the end of June. Anna Frost, world renowned mountain runner and all round enthusiast when it comes to trail running approached me in her capacity as community manager for Salomon to check on my whereabouts and ability to participate in a running dream come true. It didnt take long for me to answer in the affirmative. So I arrived in the French Pyrenees by taking a flight from LA to Barcelona and then a car journey climbing into the great dividing range between Spain and France above 2000m. Feeling pretty fresh from my duties at the WS100 I was filled with excitement of what the next few days held for me, knowing that at the end of the week I had the chance to do some more racing. 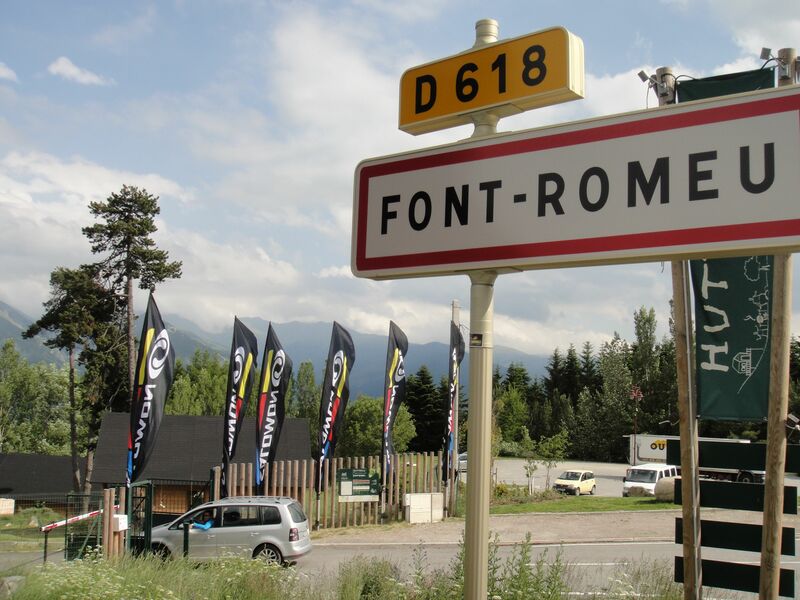 First, it was off to my accommodation, a ski lodge set in the grounds of the resort on the outskirts of the town of Font Romeu. It was easy to find by the Aussie flag flying proudly from the pole outside. It was clear that many nations were to be represented during the week by the numerous pennants flying from the eco lodges. After a quick bite of cheese, bread and snails, and a small glass of red, it was a meet and greet with the other assembled participants. They came from all around the globe and were made up of Salomon employees from their Trail Running marketing and R&D group, 15 of their International Trail Running Team, including Tom Owens, Jonathan Wyatt, Julia Bottger, Miguel Heras, Ryan Sandes, and approximately 20 journalist, community managers and runners from some of the most influential blogs, websites and magazines dedicated to the sport of running. In addition, Salomon had invited it alliance partners from Suunto and Logo Eyewear along with multiple medical support personnel including biomechanicists, physios and podiatrists. Next port of call was the gear fitting session. All I can say is that the level of detail and dialogue that went into the selection was just awesome. Every piece of equipment choice was backed up with evidence both subjective and empirical behind the design, fit and overall appeal. Whilst we are real gear junkies at ultra168, there is nothing more exciting than having the chance to choose equipment direct from the developers and also taking feedback straight from the Kilian’s of this world on why it is so good. At the end of the process we were head-to-toe in the latest training and racing gear from the Salomon S-LAB range. Whilst I can only dream of being able to run like Kilian or Jonathan Wyatt, at least I could look like an albeit slightly heavier slower version of my running idols! Its one thing to have the gear, but another to get out and try it. A small group of athletes gathered for a late afternoon run and we were soon off heading higher up the mountains for a quick reccy of our new surroundings. It was very evident straight off the bat why so many elite athletes make this home during the European summer and that is the altitude. There are trails everywhere from 2000m up to 3000+m that would take a lifetime to explore. Finally it was becoming very clear why Kilian loves the mountains so much and is somewhat unbeatable on the steep stuff, for this is his backyard and where he grew up. On returning to base I was joined by my room mate for the week, one Stu Gibson! Most Aussies know Stu from his recent performances at Cradle Mountain, TNF100 and Bogong to Hotham. Stu is a great running talent and it was awesome to have him sharing his insights into all things ultras along with his experiences from his track days. In addition, he unleashed his wicked Glaswegian humour at every turn especially when the conversations turned to sporting nations and their heritage! Later that night Stu and I had further chance to sit down with the Apparel R&D team to get a closer insight into the technology behind the S-LAB EXO SENSIFIT apparel. The debate as to whether this is compression gear went on for some time and only time will tell and a typical Ultra168 gear review in the coming weeks will be able to shed some light on whether this equipment can improve performance. One thing is for sure, on first try is felt great to wear and provided no initial concerns around form and fit. Day 2 started early with all the group gathering to take a trip up the mountain for a series of training runs led by the Salomon International Team. I was encouraged to choose the long run group guided by Kilian and even though the legs were pretty tired from weeks of racing and training in California, it was just too good an opportunity to pass up. 31kms at altitudes between 2200m and 2800m meant for a hard day in the office and we were all relieved to get home safely after 5 hours on our feet. 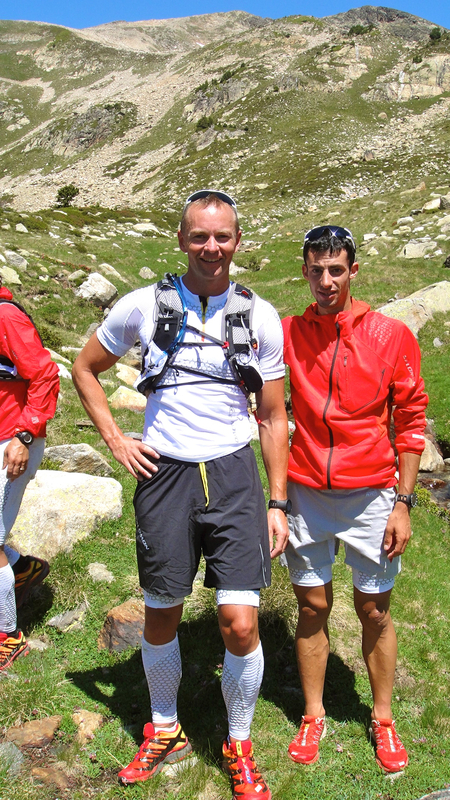 It was also a good prelude to reccy the course of the mountain races that were coming up later on the weekend. On our return I was able to get some quality time with the Salomon International athletes where I was able to question all aspects of their disciplines and to get a better understanding of the European and US trail scenes. Video interviews of these chats will be posted on Ultra168 over the coming days. One thing became clear that there is a huge racing scene in Europe with various disciplines making up the sport of Trail Running. I would get a chance to try these out in the coming days at the Kilian’s Classik race festival at the end of the week. We finished the day celebrating Kilian’s recent win at the WS100 with a couple of drinks in one of the local bars and we went to sleep knowing the next day brought even more excitement with the prospect of running with Paula Radcliffe on the trails. Own take, though, the Salomon S-Lab shorts with the mini-six-pack mesh around the outside are killer. They certainly seem to reduce effects of fatigue around the hips and lower back with their raised waistband. Only risks of chafing when they’re wet for a long time in decent rain or sweat if the banana hammock shifts at all. Easily prevented with Glyde/Bave Soldier etc. Great pockets too – all around really comfortable functional dependable kit – awesome. The calf sleeves made of the same stuff though…. at least they match the shorts. Assumed they were compression but bad call. First calf spasms kicking in at 37km of a 100km race = laaaaame. Running long 3 weeks later in X-Socks, no hassles at all and better recovery. The Salomon calf sleeves are all about thermal regulation, I reckon. And besides, to get them in a size small enough to really do anything on the calf, they’re that fragile they’ll get destroyed going over an adult-sized foot. Calf sleeves – STYLISH FAIL!!!! Roger, amazing how two people can differ so much in their views. I found the calf sleeves to be awesome, although this is initial feedback from just one weekends racing, but considering the k’s I put into them during the week my calves felt the freshest for ages. The terrain was about as rough as I ever run so I was surprised to feel good. As for the shorts, still to decide if they are any good as the fit is very different to what I am used to. More testing is required. Cant wait to join my fellow Ultra168 colleagues dressed head to tow in white! I am not sure they will hang around for me once the giggling has subsided! The new S-LAB 12 backpack is a lot of fun and will answer a lot of your questions comparisons to Nathan etc……. PS And who keeps putting the fluffy acoustic techno indy folk rock over Salomon videos? PPS I blame the altitude….. the thin air can make people do strange things ! You should hear what Vizey has on his iPod! Nothing less than 180bpm pure Dutch hard trance. Showtek baby! Oh and great article.